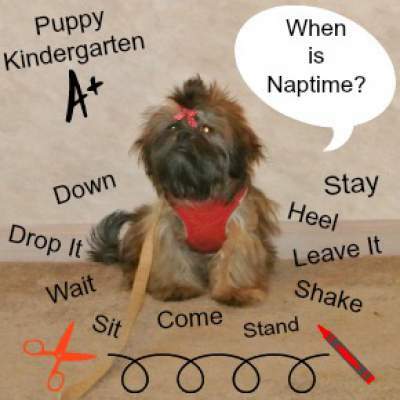 What is Puppy Kindergarten? Should You Enroll Your Dog? Whether you call it puppy kindergarten, puppy preschool, or beginner obedience classes, most training methods today involve bringing a small group of puppies together to learn basic skills. Other benefits include the opportunity to socialize around other dogs and people. Most important, if you are a new dog owner, it gives you an opportunity to ask questions and discuss issues that might be of concern such as biting, house soiling, or digging. These types of classes offer new dog owners a chance to learn a positive method for dealing with their new dog. Without any training, dogs can become little monsters and the term small dog syndrome pretty much sums it up—a tiny dog with a big attitude who thinks he rules and his subjects (you) follow. Just like kindergartens attended by young children, puppy kindergarten offers only the beginning, a place to start. No one would expect a human child to know it all after a year spent in kindergarten, so we shouldn’t expect a perfect dog after a few weeks of training. However, you will be amazed at how much your puppy can learn in just a few weeks. The training facility that you choose should assure you that the training is positive, gentle and fun. There are still some “old school” trainers out there that encourage a punishment, and you should run not walk away from anything that you would consider punitive in nature. Your puppy should be excited to go to class and have fun while he learns. Socialization is critical for puppies these days. Most small dogs are companions and spend time with their people whether it is at home or out and about. You want your dog to act appropriate when meeting other people and dogs, be friendly and not aggressive, and to show some manners. These are the things that make up the curriculum in a puppy kindergarten. Most classes will teach basic commands such as sit, stay, down, and stand. They will work on loose leash walking and give you the opportunity to ask questions. Trainers are knowledgeable about many aspects of dog behavior, so if you are experiencing problems with the puppy nipping, chewing on the furniture, or digging up the garden, this is the place to get those questions answered. What are the Requirements for My Dog to Enroll? Age: There may be a difference in classes based on age of the puppy. The classes may be divided by age so be sure that you are in the correct age group. Vaccination History: Requirements vary widely from first shots to full vaccinated. Most classes will expect at least one set of shots be given prior to the first class. Those that require full vaccinations are from old school thinking. There are some places such as dog parks that puppies should not frequent until they are fully immunized, but training classes should not be in this list of forbidden locations. The chances of your dog picking up a disease covered by an immunization is very very small. Where do I find a Class? There are many different places you can go to get a good class. Large retail pet stores offer classes as well as many veterinary hospitals, doggie day care centers, and boarding facilities. Local dog clubs are also a good source of information on where you can get a great class and most offer some type of training. You can get a list of local clubs on the American Kennel Club website. There are also privately owned centers that are focused solely on training dogs. If you want to go beyond the basic class, these centers are worth checking out. Finally, for those living near colleges, you may find that your local college offers continuing education classes in dog training at affordable rates. Even some veterinarians offer basic puppy training. Puppy kindergarten is not like human kindergarten where you drop off and pick them up hours later. Your participation in the class is required let’s be honest here. It’s called Puppy Kindergarten, but the emphasis is on teaching you, the dog owner how to train your dog. The trainer will explain the background of a specific command, demonstrate it and then have you work with your dog to perfect the skill. Homework assignments involve practicing the skills learned in class. Anyone in the home that has contact with the puppy should attend. If you have very young children and you suspect they may prevent you from giving all of your attention to the dog, find a babysitter. Older children should attend the class if permitted. Most children enjoy the experience. Costs vary widely in different locales and its best to call as soon as you find a program that meets your needs. Expect to pay about $100 for a six week course. Some allow you to pay as you go, but most expect that payment in full be made at the time you enroll your dog. Private clubs may be more expensive and college continuing education classes might be a little less expensive. Are there Alternatives to Attending a Class? If cost is an issue and you want to tackle training on your own, by all means do so. The information on this site provides instruction in basic commands, and you can borrow a book from the local library or purchase an inexpensive training manual online. You will still need a collar, leash and treats to begin. Whether you choose to attend classes or train your dog by yourself, you owe it to your dog and your family to teach basic skills and socialize your dog around other people and dogs. Training will pay off in big dividends in the end as your dog matures to a happy, well-adjusted adult dog. Most puppies benefit from group time, but some will need one on one training by skilled professionals. If this service is not available near your home, you can try training your dog at home. You are not confined to the strict curriculum outlined by the trainer. If you think that you'd like to strike it out alone, there are many excellent books that you can read. Here are a few of my favorites. Dr. McConnell never fails to entertain, engage and educate us on the many aspects of dog behavior. This is just one of her books that all serious dog owners and enthusiasts should own. One of my favorite trainers, Dr. Yin, whose legacy on earth continues with many of her books still in publication. If you never read another puppy training guide, this is the one that should find a prominent place on your book case. This book by Kyra Sundance is a must for anyone want to learn how to train a few tricks to their dogs. These go beyond the basic skills all dogs should know and is meant for training enthusiasts who want to impress others with their dog's clever antics. Use this book in conjunction with the cards below for an easy system that grades trick mastery on a scale from easy to difficult. This is not so much a book but a series of cards that publish one trick or command per card. This card system is intended to be used with the book above, 101 Dog Tricks: Step by Step Activities to Engage, Challenge, and Bond with Your Dog by the same author.